Laboratories store and handle different chemicals in their daily operation. Some are flammable and some are corrosive, while others are completely inert. One key to laboratory safety is keeping using chemical containers that minimize the risk of spills, fires and toxic vapors. Carboy containers provide these functions. The term "carboy" originated in the 1700s. It derives from an ancient Persian word "Qarabah", which means large flagon. These vessels were made from glass and covered with papyrus or wicker. In its history, a carboy was also called a demijohn. Today, this term is more associated with wine and spirits. Carboys are common products for home beer brewers. In laboratories, carboy containers are associated with chemicals. Laboratories use carboy containers for transporting, storing and dispensing solvents, buffers, reagents and powders. 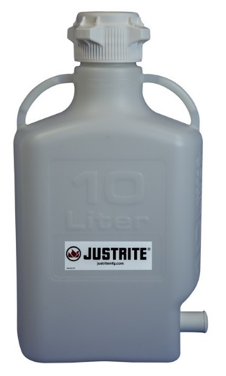 Rigid chemical containers that are highly resistance to chemicals, Justrite carboys range in sizes from 0.7 to 10.6 gallons. Amber-colored carboys are suitable for light sensitive applications and heat stability. Plastic carboy containers have advantages over glass carboys because of their durability. They do not break or chip when dropped and bumped. Lab technicians may keep using chipped glassware if it is still functional. But, cuts from glassware is one of the top five most common lab accidents. It is easy to slice a finger during cleaning. Glass also shatters when over-pressured. When this occurs, chemical spray from the explosion as well as shards of glass may fly across the lab. Glass carboys with exteriors coated in of plastic resin or plastic carboy containers may protect against injuries from glass shards. Laboratories often use carboys to collect chemical waste. Some carboy containers attach directly to HPLC machines, accumulating waste after each analysis cycle. Waste chemicals can be more hazardous than new chemicals, especially when different waste streams mix together. Cleaning waste carboys thoroughly is vital to prevent reactions between new waste and residue from past use. 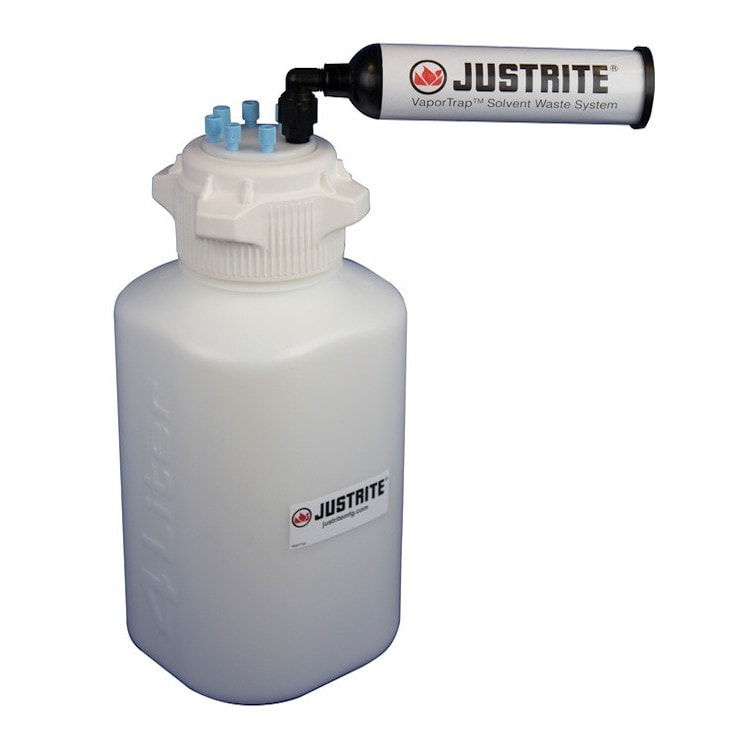 With wide 120-mm openings, Justrite carboys are simple to clean. Many labs use carboys to transport chemicals from one part of the lab to another. Designed with ergonomics in mind, the rectangular shape of Justrite carboys saves valuable desk and storage space. Molded hand grips on the base and large top handles makes them easy to carry, lift and pour. Printed markings identify the material type, volume and metric graduation. High Density Polyethylene (HDPE) has excellent chemical compatibility. These carboys consist of USP Class VI, FDA grade materials. HDPE carboys come in many sizes. Some models include spigots for ease of dispensing. Polypropylene (PP) carboys consist of autoclavable USP Class VI, FDA grade materials. It’s simple to sterilize PP carboy containers using an autoclave. 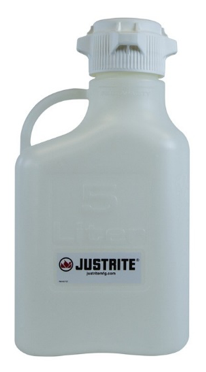 Justrite’s PP carboys feature similar models to its HDPE carboys. This range also offers dark amber carboys for light sensitivity. 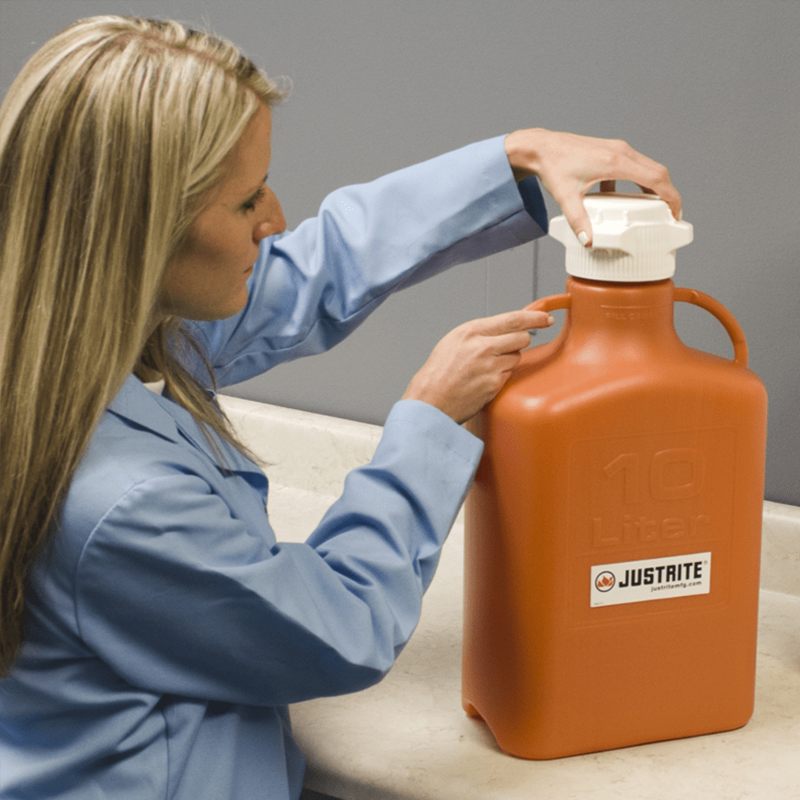 Justrite offers a chemical compatibility guide for carboy materials. But, remember the ultimate source of chemical compatibility is the chemical’s Safety Data Sheet (SDS). Justrite also supplies specialized carboy containers for HPLC waste collection. These feature custom-designed caps with individual ports for accepting waste from multiple HPLC machines. A carbon filter cleans vapors before they enter the atmosphere. Laboratories deal with hazardous and flammable chemicals every day. Make sure your laboratory chemical containers provide the safety you need. Browse our complete line of lab carboy containers and solvent waste systems here.